Arrrrgh. I just worked on this post on my computer and it lost all my data. Grrrrrrrrr. I’m re-writing on the iPad, so forgive everything that will occur from here on out. I can’t believe that I am posting about a plant, especially after yesterday’s post about being a card-carrying Garden Hater, but this is actually kind of a post about time lapse photography. 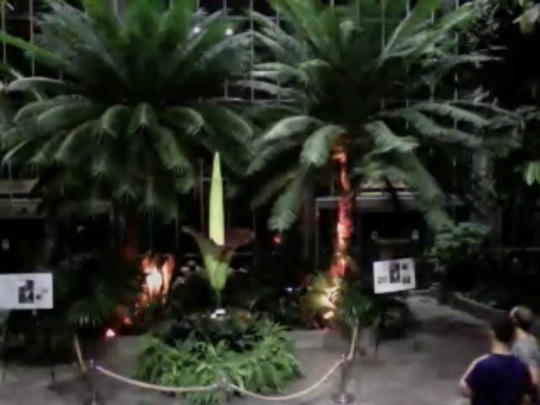 There is a corpse flower at the U.S. Botanic Garden (I don’t know where it is) that has been about to bloom for some time now. The story caught my eye because long ago Brad planted something similar – a plant that smells like rotten meat when it blooms. Brad’s plant was small, though. This thing looks like it’s straight out of Little Shop of Horrors. This plant is a big deal because it only blooms every couple of years, or sometimes more than a decade. The conditions have to be just right blah blah blah. I have had some trouble sleeping lately and when I am awake with irrational thoughts, one of htem is, “Of course you can’t sleep! The plant is blooming now! Check the live feed! 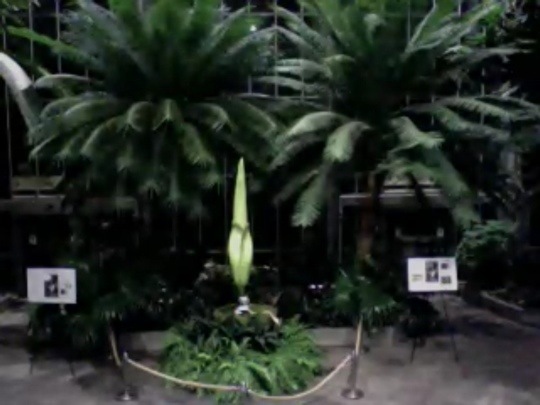 Check the live feed!” So I would check, and it wouldn’t be blooming. Stupid irrational mind…. But I would take a screen shot. So this evening, when I was rational, I thought about it and checked on it – and it bloomed! It’s going to stay open for about a day and then I guess it… wilts? Eats someone? Anyway, I hope I get to sleep tonight. Dang it! This is in driving distance of my house in Baltimore. It’s right next to the capitol building. I would have definitely gone for a visit if I were there. That plant is so weird! I can’t decide if I like it or not. I mean once it opens….it’s not that pretty to me. Of courese the fact that it only opens every few years…or every few decades…depending on its mood… is impressive I suppose. But it seems so … so … narcissistic. “Behold the wonder of me…What’s that….oh you missed it….well, try again….if you’re still living when I open next. Ha! *fist shake at plant* I completely agree. Brad, you should work at that plant place. They would think you are some kind of savant.